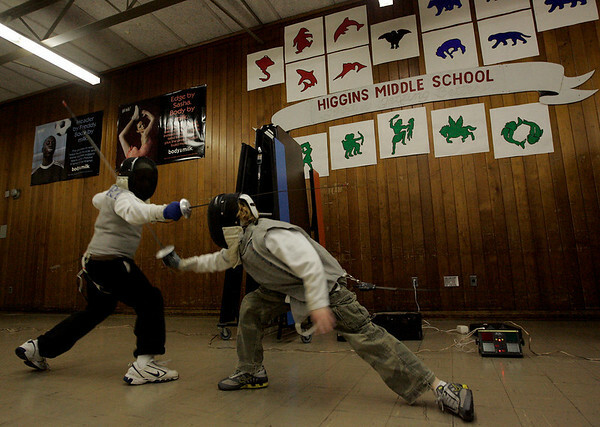 Peabdoy: Rafael Rivera, 11, of Peabody, left and Troy Sliney, 9, of Haverhill practice a fencing drill during the Tanner City Fencing Club practice held at Higgins Middle School Wednesday evening. Coach Molly Sullivan Sliney is a former Olympian and partner coach, Jane Carter is a Pan American games gold medalist. Photo by Deborah Parker/Salem News Wednesday, December 17, 2008.